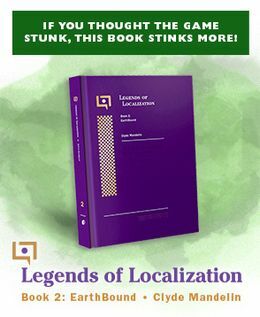 Congratulations to Vecna and everyone involved in making this translation happen! 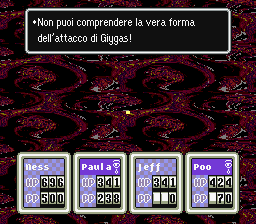 8 Comments to EarthBound Translated Into Italian! Hope this makes the EB fandom grow bigger. It’s still super-hard to find italian Mother fans. As always, I’m curious about what the translators did with the “YESterday” riddle. I know that for the Portuguese translation, they used “SIMplicidade,” which could work just as well for the Italian translation (the Italian affirmative being “Si”) if Italians are sufficiently familiar with Portuguese pop music… though it might be kind of weird otherwise. Even in Brazil that music isn’t very well known. 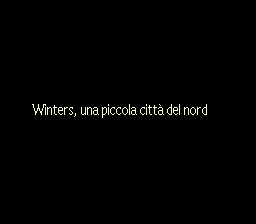 But I guess it shouldn’t be hard to find a Italian music that starts with “si”. 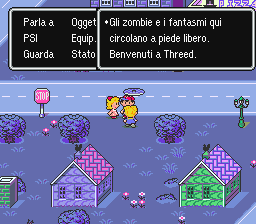 Just wanted to hop in and say my italian translation (a different one from Vecna’s, more focused on Mother 2) is still going strong. 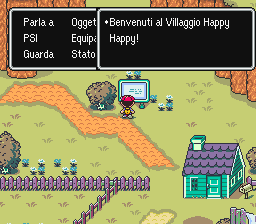 It’s very cool to see the game playable in Italian, but judging from the screen-shots, some of the humor seem to have been lost in translation. 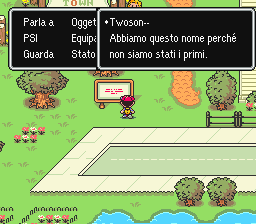 “Twonson, abbiamo preso questio nome perche non siamo stati i primi.” translates into “Twoson, we chose this name becouse we weren’t the first” Unless you speak english, you won’t get the joke. 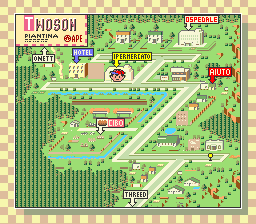 Still, very cool to see, and is awesome that it’s possible to play it in Italian.